Though it is not unheard of for commuters to invent fun, innovative and quirky commuting strategies via boat or plane, designers in London attempted to reinvent the wheel for commuters with speedos. 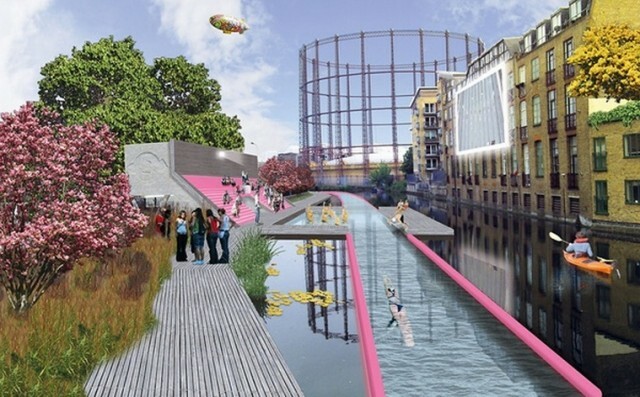 The Lido Line, a proposed reinvention of the underused Regent’s Canal, would have commuters breast stroke, dog paddle and butterfly the 8.6-kilometer (about 5.3-miles) length of the waterway through the heart of central London. The Capital of the Britons, not known for its warm weather, would convert the waterway into an ice-speedway for skating commuters during the winter months. How charming an ice-skate to work would be: no tube queues, nor transport fees for what is the most expensive public transport network on earth. The design firm who proposed the Lido Line, Y/N Studio, came up second in Architizer Magazine’s “High Line for London” contest. The proposal was bested by a design for a “low line”, a repurposing of unused tunnels for pedestrians and gardens. The subterranean version of New York’s High Line is perhaps more Middle Earth than down to earth. While dreaming of the frigid, hour’s long swim to work, perhaps a real world alternative for us dreamers might just be the bike ride to work across one of London’s gorgeous – if not dreamy – robin’s egg blue cycle superhighways.